This time the spotlight will be shining on History of the Demon Girl, which has you running through hell… quite literally! Let’s see if we can’t help it escape the cold emptiness of Greenlight limbo, eh? In History of the Demon Girl players guide Roku through 9 pixelated Circles of Inferno. Along the way she’ll meet all kinds of strange creatures and tortured souls which she’ll release in a timely fashion if she wants to avoid the stinging barbs of her large demon companion Sam. More like, “pixelated, chip-tuney and fast-paced”, eh? No better way to experience a dash through them infamous nine circles, though. 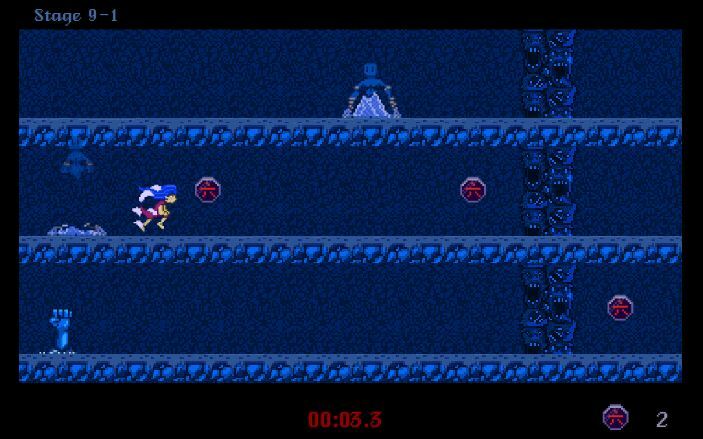 Even more so, since its creator claims the title features “arcade style twitch gameplay” and draws upon the likes of Bit Trip Runner for inspiration. Doesn’t mean you’ll be jumping over obstacles, blocking incoming projectiles with a shield and such on a simple pre-determined path however, as the main mechanic lies in switching between three different tiers (lanes?) to, well, dodge obstacles. Alright so there’ll be some obstacle dodging, but my point remains valid. Also, did I mention each level has (allegedly) been designed by… The Devil? Yup. Guess he’s back from his trip to Georgia. So riddle me this, dear reader: why is History of the Demon Girl. still struggling to get through Greenlight? It’s not out just yet, but a demo is available from its IndieDB page. For now, why not visit its Greenlight page and hand over a ‘yes’, if you like what you see? Remember: your vote matters!